Most Mac users are likely accustomed to the San Francisco system font in MacOS Sierra by now, which was first introduced in El Capitan after initially changing to Helvetica Neue in Yosemite. But if you’re a creature of habit, you may still prefer to have the good old classic Lucida Grande font as the system font in MacOS Sierra. 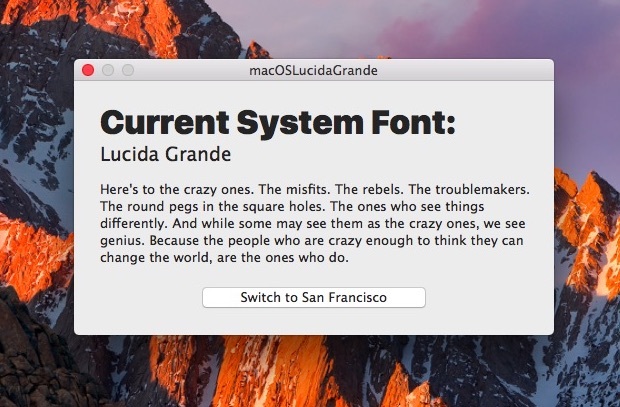 With the help of a little third party tool, you can change the MacOS Sierra system font to Lucida Grande again. This is using the same type of tool that we used to change the system font in El Capitan to Lucida Grande, all it does is introduce a modified system font into the /Library/Fonts/ folder, making it easy to reverse. This does not offer a perfect change to system fonts, there are some known display issues with password prompts, some dialog boxes, and tabbed windows. If you are not OK with the quirks that may exhibit in macOS by using this utility to change the system font, don’t use it. You should always backup your Mac before performing any modifications like this. To open the app you’ll either need to use the unidentified developer app bypass with a right-click, or allow apps from anywhere by disabling Gatekeeper in MacOS. Once the macOSLucidaGrande app is open you can choose to “Switch to Lucida Grande”. You will want to log out (or better yet, reboot) to have the changes take effect throughout MacOS and applications. 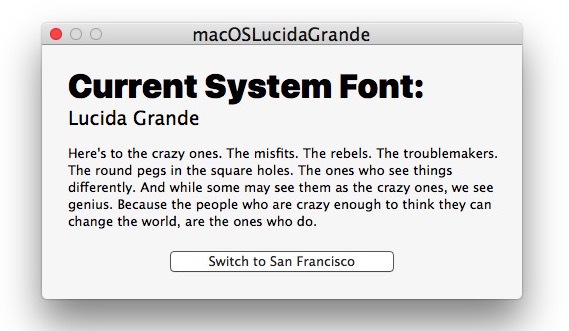 To reverse the change and return to the default system font in MacOS Sierra, re-open the macOSLucidaGrande app and choose “Switch to San Francisco”. The difference between the two system fonts is very subtle and many users wouldn’t even notice the difference, the gif below demonstrates the two of them changing back and forth in a Finder window. If you have no particular opinion about the system font on the Mac, you should not change your system font, mostly because using Lucida Grande in Sierra is unsupported and has some known quirks that can lead to unusual font display issues including the inability to display password entry characters. Thus this is not for novice users and it’s not for users who want a perfect experience with their system fonts. This is really for those of us who really prefer Lucida Grande for whatever reason, and not for casual use. Do you care about the subtle differences in the system font in MacOS Sierra? Do you like Lucida Grande or San Francisco? Both choices pale in comparison to Input from FontBureau. Free download and replace the system font — you’ll thank me! Input is a little too thin and squished together for my needs, I think it is called kerning, which is my primary problem with Helvetica and Francisco. Lucida is easiest to scan quickly, I don’t know why they changed it without allowing an option to change back. User preference would be ideal! The latest update of Input is for El Capitan. Does it work properly with macOS? I loved it in Yosemite (didn’t know they update it for El Cap) and I would like to try it, but I would not want to risk render my GUI unreadable. The password entry bug is annoying but maybe we could look at it like a security feature,, haha! Long live Lucida Grande! The best UI font ever made! I like SF. It’s easier to read. I think it’s best to not muck around with system fonts. Will the developer of this tool help you fix the problems caused by using it? I think that this is one feature that Mac users simply need to get used to, and move on. In my work, I won’t support hacks for my customers. Once I start, I own them. I will have to keep the hacks working forever. All system modifications should be entirely caveat emptor. If someone isn’t savvy enough to manage the responsibility and any consequences, they shouldn’t be using it. Kind of like owning a gun or driving a car. I would agree though don’t put any mods like this on client computers, they’d be confused. Modifying the system font should be a simple and risk free task by now. Apple is really far behind their competitors when it comes to customizing. MS Windows users have been able to change the displayed system font for over 20 years. That, as well as changing the window colors, have been standard, easy to access features, at least since windows 95 was launched in 1995. Yet Apple users still, in 2016, have to use a hack in order to do the same. It used to be that you *could* change the system font on Apple machines. You could make it Old English if you wanted! It’s not that they are “behind”.. it’s that they’ve abandoned the idea that the user should be in control.. or something. I sure can’t figure it out. You are right, except they never really had the idea of the user being in control. Absolute control was always Steve Jobs’ policy. He started in the 80s selling computers that not only were not upgradable but were totally uncompatible with any 3rd party peripherals or software. He got to the point of using special screws so nobody could open up a mac. While he relented a little on this in later years after those computers were a flop (by creating the appstore and allowing limited customization macs and later iphones and ipads), he still went on to control how and where Apple products were sold by creating the Apple Store concept and opening his own stores. So no, Apple did not abandon the idea of user control. They’ve just never been completely into it. And also, it looks like their products are aimed at less tech-savvy users than Microsoft’s and more oriented towards graphics and entertainment (many youtube bloggers edit their videos using macs, for example). The only thing I like is that the OS is the same for everyone: there is no MacOS Sierra professional or MacOS home premium, for example. Everyone who runs MacOS gets exactly the same. Not anymore on Windows10. User need 3rd party tool to change the fonts. I’ve seen something on the blog about windows machine cannot boot up/login page just blank after they messing around with system fonts. same as in ElCapitan: issues. there are more than just one system font folder addresses. After Apple’s short foray into the beginning of allowing for the customization of the Mac GUI, Steve Jobs, upon his return got down right possessive (paranoid?) about the value of the screen real estate as Apple’s proprietary branding and threw out the hooks we exploited to make Color Schemes (Kaleidoscope) and Themes. Ever since then it’s been all Apple all the time and forget it if you’d like to customize it. Fonts, colors, even the shapes of windows were on the verge of being at the users command. But no, Steve wanted it all to be his and behind the scenes worked feverishly to stop all the GUI developers that were positioning themselves to take over that facet of the Mac experience. Otherwise Greg Landweber, Akamai Design, DS Group, and eventually others would have turned the Mac OS GUI into the property of the user rather than the masters at Apple. Remember Designer Studio? The Scheme Archive? Kaleidoscope sure was fun, I remember that well. Then briefly with Copland / Mac OS 8 we had the High Tech, Stencil, and Gizmo themes to change to through system mods, that was also fun. Oh the good old days…. highly customizable but the OS was a lot buggier back then. I hope we get a true dark theme for Mac OS 10 soon, the bright white is OK but in dark lighting it’s dreadful. Is there a way to DISABLE the trackpad? So, I’m stuck with this font throughout the system that’s hard to read and some appear gray? What font is it anyway? Annoying. Agree the new font in Sierra is difficult to read, fuzzy, and a bad color. Please Apple, pay attention! Shame that Apple doesn’t listen to anyone outside it’s walls. Can you please make an High Sierra update patch, please? « Unable to Click with Trackpad or Mouse in Mac OS? Here’s the Fix!